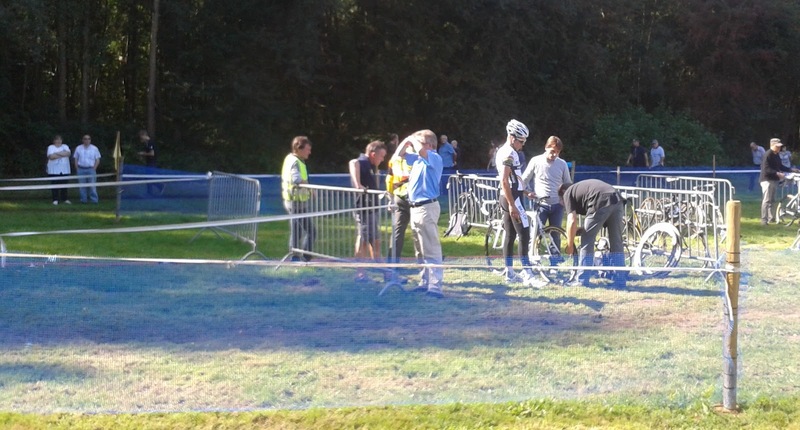 On Sunday last weekend at Erpe-Mere I had my first professional cyclocross race. That is to say, my first race against professionals. I was under no illusions of where I stood in relation to them, but I had it further reinforced just how fast being professional really is. I'd stayed with Darryn and his family at their place in Gent the night before, and he generously offered his services as my race mechanic and officer of transport and logistics. He's done a lot of 'cross races in the past year or two, including some of the World Cups so he knows what it involves. I am still used to leaving home and riding down the road an hour before the start of the race, putting on a number and going for it. As I am finding out, things happen quite differently over in these parts, especially at the big events. By the time we got to the race, everyone else was there and set up with their faces plastered to the sides of their personal motorhomes, team trucks and marquees. The sponsorship of riders goes from the professionals right down through elite without contract and to juniors. Of course, only the pro's get a salary but the fringe benefits for the others of bikes and equipment, mechanics, team vehicles and race entry combine to cover virtually all the costs of a young cyclist's life. After sorting out my entry and getting my race numbers (two small ones for my upper arms, one for my back) I rode a few laps of the course. Although everybody was already there, they must have been tucked away in their palatial vehicles warming up on trainers because I hardly saw anyone out on the course. I did see that there was quite a crowd building up, keen to be part of the first A grade cyclocross race of the season. With around 5,000 spectators it's certainly not as big as some of the races later in the year will be, but as a first look at the top Belgian riders and my first experience of a race with fans (not just family members and friends!) I thought it seemed like a pretty big crowd. I have written about the race on my new section of the Spoke Magazine blog which I will be contributing to on a weekly basis now. In an effort to avoid treading on my own toes and repeating myself however, I'll be looking for different aspects to comment on here. One person who I recognised when I got there was this man, consulting with his mechanics just before the start of the race (probably having .125 of a PSI added into his rear tyre). As is standard for these races, all the riders gather in a starting pen just off the main start/finish straight. From here riders are called up to the starting line in the order they are ranked based on the international UCI points that they have. For these early races it is based on last season's points, and although I earned 60 points from my 2nd place at the NZCX National Champs back in July in Napier, it was considered out of season for the northern hemisphere racing calendar, and won't apply until this coming January. So it was unsurprising that I found myself called up dead last, taking my spot about 4 rows behind the above World Champion. The course for this race was quite different to the others I've done so far. The Dutch word for cyclocross is veldrijden, literally field riding. That is basically what the B-grade courses have been so far - flat grassy dusty sandy off-road criteriums, straight from the gun, full spead ahead. I had been told that the A-grade courses are nicer, more interesting and typically more challenging. Erpe-Mere definitely fitted this description, with the usual flat early section punctuated by corners and a couple of barriers leading into the forest, and with it a big mix of terrain. It has been very dry the whole time I've been here, with only a few days of rain in nearly two months. However there was a small section of sticky, slightly boggy mud that somehow managed to survive through the drought of summer intact. I don't know how it did this, but it made for a good spot for spectating: deep ruts that are fine if you can follow, but as soon as your balance leads you off to either side it can end in spectacular fashion. As was the case for several riders in front of me on the first lap, and again later on. We then headed up and down several very short and very steep slopes, with tight corners between them. It was really important to carry as much speed as possible down the ramps in order to make it back up the next one, but it was a hairy business what with the combined elements of the angle of the corners, them being off-camber in parts, and very dry and dusty. I was glad to have practised the course a few times over as part of my warm up for the race, so I was able to anticipate the necessary manoeuvres. This being said, when someone crashes in front of you at the apex of a corner, there's not a lot you can do to avoid getting held up. My favourite aspect of this race was definitely the supporters that lined the course all the way around, but particularly in several key spots. It is traditional for the fans and public to come along, pay around €5 to enter the course zone, then spend the afternoon drinking beer and getting progressively more rowdy as the day goes on. A lot of them are just families out for a day spectating or following their favourite cyclocross star, but a lot of them are groups hell-bent on getting really into it and moving around the course cheering like mad, seemingly with a penchant for extra encouragement towards underdogs or foreign novelties such as myself. There was a long bumpy corner after we came down back out of the trees that lead into the finishing straight, where one particularly enthusiastic group were located. I could hear them from quite far off calling out my name, in various forms - Alex, Alexander, Nieuw Zeelander - and the closer I got the more manic their fanaticism became. After I had passed, and been through the home straight, the course looped back around and they would all rush across to the next section to repeat their chanting and bellowing. I couldn't take the smile off my face riding around hearing it, so much encouragement, and it gave me so much energy! The other section where the crowd were really going off their trolleys was a section of two very steep ramps one after the other, with a bike-length between of flat. This was absolute brain-haemorragingly steep material, accelerating as much as possible into it, then super low cadence pedalling trying not to have your rear wheel skid or your foot unclip. A few times through here I was alongside another rider, and the shouting was completely defeaning. After the race I had a few people come up to me and sort of hover around, not always saying much. 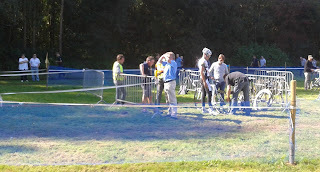 Others directly spoke to me, and wanted to know more about why I was here and what was cyclocross like in New Zealand. When Darryn and I were getting ready to go, a big group of teenage boys came over and asked me for autographs. They didn't have pens or paper, so when I found a pen all there was for me to sign was various limbs and bits of skin. It was a bit weird, but I appreciated being humoured for my celebrity status. I definitely need to work on a more pro signature, and something that incoporates my biggest drawcard, this big hairy thing between my mouth and nose. I couldn't help but enjoy the celebrity status I gained that day, however genuine it all was. According to Darryn it will get to the point where I'm sick of it because I won't be able to go anywhere without people stopping me all the time, not ideal in the middle of winter when you're wet and muddy and need to change clothes. But for now I'll let myself indulge a little, happily using distance from home over podium spots to get my fan base going. Cool looking course and more great writing, keep it up Mr Moustachio. yep, go the mo. Great story Alex! Great stuff Alex! Really appreciating you taking the time to describe your adventures! I had a great time in the pits as well! BTW, amazing photo's super photographer....lol! Of course! Thank you very much. What a versatile man you are. Where would I be without my professional photographer, driver, mechanicien, logistical expert, tactical mentor, public relations and communications manager and fellow NZer Sir Darryn Ernest Medhurst? you can reassure his Mom! or give me your phone/mail details please.